Located between the Willis Education Center and William Street United Methodist Church, the commercial building at 50 W. William St. in Delaware could soon be razed in favor of a new two-story structure. The uniquely shaped, vacant commercial building at the northwest corner of the intersection of West William and North Franklin streets is destined for the chopping block after the City of Delaware Historic Preservation Commission last week informally supported a request to demolish the 91-year-old structure. 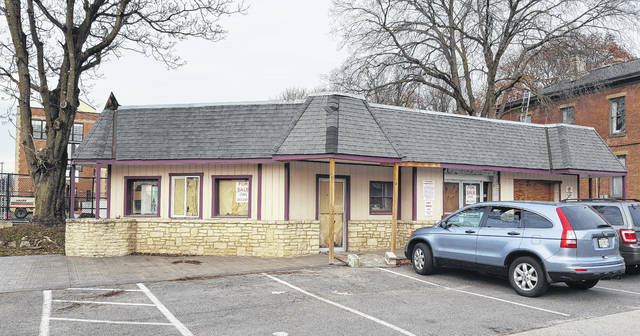 Located between the Willis Education Center and William Street United Methodist Church at 50 W. William St., the property has been vacant for approximately five years, with the last tenant being the Mid Ohio Printing Center, said city Development Planner Dianne Guenther. While the site was once home to the William Street United Methodist Church before the old church was converted to a school and eventually served as city hall for a brief time, the current structure, built in 1926, isn’t original to the property. Guenther said for decades the building housed a Sohio gas station, and it isn’t part of the Historic Northwest District, which is included in the National Register of Historic Places. Unfortunately, she added, the building has seen better days, and an attempt to renovate it several years back to house a smoothie business (project fell through because of financial reasons) may have been the last go-around at trying to save the structure. “The building on site is in an unsightly and unfinished condition,” Guenther said. “To put it bluntly, it’s basically butchered up on the inside. Every wall, every ceiling, and every floor has been compromised. “Due to its current condition, and in order to comply with current code standards, city staff believes that the most prudent avenue to take would be the demolition of this particular property and rebuilding on the site,” she added. City residents Jeff and Jill Rice, who are currently in talks to purchase the property from current owner David Hutson, presented to the commission their plans for demolition and construction of a new two-story commercial building on the site. Mr. Rice said initially, the couple looked at rehabbing the building, but upon closer inspection, that idea wasn’t feasible. “It’s in worse shape than we really thought. It’s in very poor condition,” he said, adding that since the property was previously home to a gas station, the proper environmental assessments will be carried out. It’s unclear, Mr. Rice added, if the underground gas tanks have been removed or not. Mrs. Rice, a trained and licensed exercise physiologist, told the commission she would like to open a boutique fitness studio on the first floor that would focus on individualized fitness and exercise programs. As for the second floor, Mr. Rice said instead of making it into office space, the couple is considering two executive-style rental units that would bring temporary housing to the downtown area, which would require the property to be rezoned from B-3 Community Business District to B-2 Central Business District. After hearing from the Rices, commission members were on board with the proposed demolition and reconstruction plans. However, since the meeting was an informal review of the plans only, the Rices will be required to submit formal plans at a later date for final demolition approval.